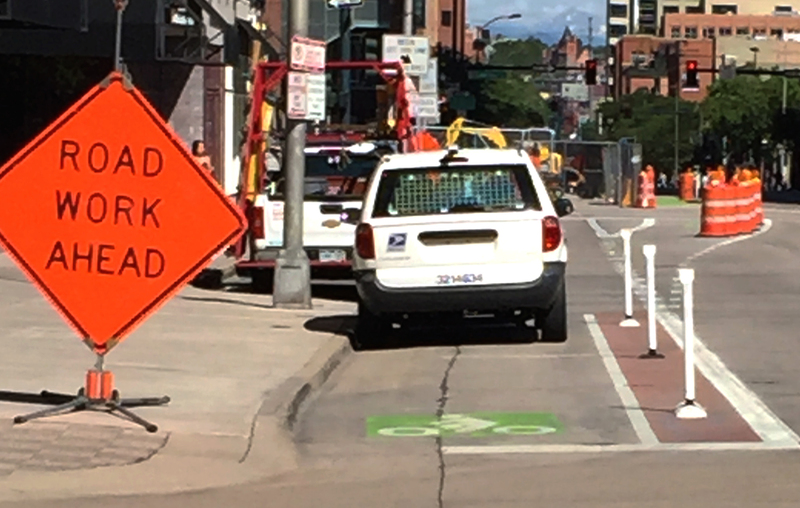 On the way to Streetsblog Denver’s office in LoDo yesterday morning, a driver with the United States Postal Service was clogging up the 15th Street protected bike lane with his van. He plopped himself right behind a “No Parking Any Time” sign. As you can see from the picture above, he left no room for me or other people on bikes to pass without riding into traffic. I tapped on the vehicle’s window as cars brushed by on the right. I told him he was parked in a dedicated bike lane, and he was forcing me into a dangerous situation. “Where am I supposed to park?” he said, as if the only possible place to come to a stop is immediately in front of one’s destination. “Where am I supposed to ride?” I rebutted, pointing at the “no parking” sign. “So call the cops,” he said. Call the cops. That’s one option, but enforcement should be preventive, not reactionary. The responsibility lies with Denver police to strictly enforce rules against parking in bike lanes, so people on bikes don’t have to worry about getting forced into traffic or interrupting their trips to call 911. The 15th Street protected lane is obviously meant solely for bikes, but the lack of enforcement allows cars to treat it otherwise. Drivers can be fined up to $175, towed, and cited, but how often does that happen? Drivers also have to obey posted “no parking” signs. But there’s a loophole in the municipal code that allows drivers of certain vehicles to ignore those signs based on the “traffic engineer’s discretion.” Perhaps the postal service is permitted to do that, which would explain the driver’s air of entitlement. Some companies consider tickets for parking illegally the cost of doing business. Maybe the fines should be graduated for them so that’s no longer the case. Accommodating drivers who insist on parking right in front of their destination negates the purpose of protected bike lanes. The City and County of Denver and the Denver Police Department need to strictly enforce the prohibition against parking in bike lanes, otherwise bike infrastructure won’t deliver on the protection it’s supposed to provide. This is what happens when 10% of the users on a facility try to get their way. The 90% usually prevail. This lane is just not a very good design. There should be some actual physical separation and no mixing zones. Bollards just don’t cut it. Yeah, pretty common. The valets at Hotel Monaco used to use the bike lane as their valet temporary parking lot. They’d even get annoyed at bikers for getting in the way. Bollards won’t do the job. We need a stronger design. I agree he shouldn’t have parked there. But would it really have endangered you so much, David, to just go around the mailman’s van? When going around the mailman’s van means stepping into a lane of rush hour traffic? Yes, that’s dangerous for me, someone who bikes often. But it’s more dangerous for someone who is new to biking, or someone biking with their children, for example. The lane was built to protect people of all skill levels, so that all Denverites have safe choices in how they get around. So accommodating parking in the bike lane undermines its purpose. Unfortunately I think most cities are reactionary, tending not to change their lax attitudes towards serious problems until something pretty terrible happens. Well, everyone has a different endangerment tolerance, David. Yours must be pretty low. I would have just gone around him and gone on my way. If you bike in Denver (and I do), you’ve got to ride in traffic sometimes. I guess the two seconds you’d have been in the traffic lane in this scenario do not represent that large a threat to me. But realistically, David, we’re never going to spend sufficient money to provide protected bike lanes everywhere, on every street, on every route cyclists want to take to their destination. Heck, the city isn’t even spending money on the bike plan it already has in place! And if I were a parent with small children on bikes (which I was many years ago) I wouldn’t be riding with them on a downtown street, protected bike lane or not. It shouldn’t matter a person’s “endangerment tolerance”. The idea I think David is trying to (respectfully) convey is that there is currently a bike lane on this section of road. The city planned it, the city approved it and the city spent money on it to be so. As with any other roadway infrastructure, the laws should be followed, and if not, and seen as a potential danger to others (which this is) those who ignore the rules should be instructed otherwise by an official in a role to do so (be it through financial, or simply verbal enforcement) like any other stretch of road, bike lane or not. We don’t spend money putting bike lanes everywhere, and because of that I feel we should respect them where they have been placed. I think it’s a slippery slope to say that if it doesn’t pose a threat of safety to one person, then it doesn’t pose a threat to anyone. And we all-to-often (I’m sure as a bike yourself, nwestergaard) see bike lanes used as a motor vehicle auxiliary lane be it for parking, as a turn lane or even as a place to put signage and construction equipment. This is not the intended purpose for this lane and those infractions to the rules should be treated the same as if they were obstructing a lane of road (car) traffic (which I think we can agree would be handled rather quickly). Again, the number one reason people don’t ride bikes as often as studies show they would like is mainly because there is a lack of safe roads and routes to make it a desirable transportation model. Building protected bike lanes (effaces on “protected”) is a way of changing that mentality, and for it to work it must be enforced. Bikes ought to be on side streets, not on busy streets anyway. You wouldn’t even need dedicated bike lanes. If you’re not in a hurry, (read “on a bike”) going a block or two out of your way shouldn’t bother you. I rode my bike when Denver was much smaller but I’d never ride on a busy street now. Those of you that do are nuts to begin with, – just sayin’. Which side streets would you recommend riding if one’s destination is downtown? Kati, once you get downtown, you’ve reached your destination. Maybe lock your bike and use the mall shuttle. (sorry for the late response). I see your point that congestion and safety are issues commuters face downtown. If all cyclists parked outside downtown and then used the mall ride or walked, that would free up a little asphalt, and possibly keep them safer. However, the same could be said of people who drive cars — if they found a parking garage outside downtown and then used the mall ride or walked, that would definitely free up some asphalt, and keep cyclists and pedestrians safer. However, the roads are designated for both auto and bike use. Assuming we can’t make people not use the mode of transportation they wish to use, I think the best thing we can do to avoid congestion and potential conflict downtown is to keep all lanes open for their intended use. Exactly, I use light rail to get into town. I can’t see adding my vehicle to the already busy streets, not to mention the cost of parking. You’re right about keeping lanes open for their intended use, – roads have traditionally been designed for cars, we’re just getting started with finding ways to incorporate bikes into the mix. There are too many that think these changes MUST happen overnight. My bike is my only mode of personal transportation, some times I am in a hurry, just like those in cars. Well, not really JUST like those in cars, you can maybe reach a top speed of 25mph ~. That’s a little more than idling speed for a car. I would have called the cops. But I’m vindictive. Also well-to-do and used to having power.